Register online at Rentonwa.gov/CyberSignup | 15 DANCE & MUSIC r YO U T H DAN C E Steppin' Together Dance Program Guidelines "Steppin' Together" Dance offers pro- fessional instruction with a strong emphasis on technique, fitness and fun, all in a nurturing and motivating environment. Each student receives individual attention, initiating the creative expression, joy and appreci- ation of dance and music. Ballet and jazz shoes must have leather bottoms. • Students in Ballet and Creative Movement classes must wear ballet shoes. • Students in Jazz classes must wear jazz shoes. • Students in Hip-Hop classes must wear sneakers and comfortable clothing. • Students in Tap classes must wear tap shoes. 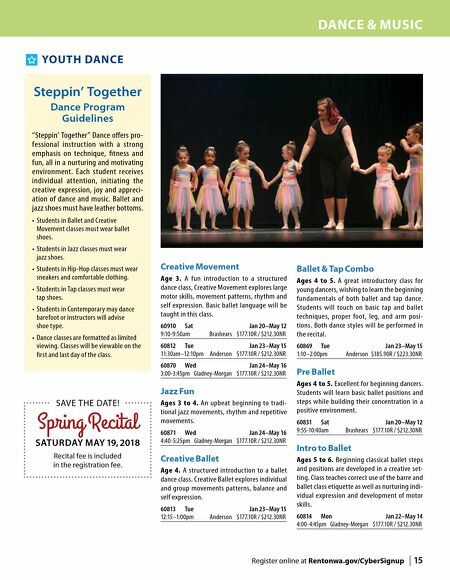 • Students in Contemporary may dance barefoot or instructors will advise shoe type. • Dance classes are formatted as limited viewing. Classes will be viewable on the first and last day of the class. Creative Movement Age 3. A fun introduction to a struc tured dance class, Creative Movement explores large motor skills, movement patterns, rhythm and self expression. Basic ballet language will be taught in this class. 60910 Sat Jan 20–May 12 9:10-9:50am Brashears $177.10R / $212.30NR 60812 Tue Jan 23–May 15 11:30am–12:10pm Anderson $177.10R / $212.30NR 60870 Wed Jan 24–May 16 3:00-3:45pm Gladney-Morgan $177.10R / $212.30NR Jazz Fun Ages 3 to 4. An upbeat beginning to tradi- tional jazz movements, rhythm and repetitive movements. 60871 Wed Jan 24–May 16 4:40-5:25pm Gladney-Morgan $177.10R / $212.30NR Creative Ballet Age 4. A structured introduction to a ballet dance class. Creative Ballet explores individual and group movements patterns, balance and self expression. 60813 Tue Jan 23–May 15 12:15–1:00pm Anderson $177.10R / $212.30NR Ballet & Tap Combo Ages 4 to 5. A great introductory class for young dancers, wishing to learn the beginning fundamentals of both ballet and tap dance. Students will touch on basic tap and ballet techniques, proper foot, leg, and arm posi- tions. Both dance styles will be performed in the recital. 60869 Tue Jan 23–May 15 1:10–2:00pm Anderson $185.90R / $223.30NR Pre Ballet Ages 4 to 5. Excellent for beginning dancers. Students will learn basic ballet positions and steps while building their concentration in a positive environment. 60831 Sat Jan 20–May 12 9:55-10:40am Brashears $177.10R / $212.30NR Intro to Ballet Ages 5 to 6. Beginning classical ballet steps and positions are developed in a creative set- ting. Class teaches correct use of the barre and ballet class etiquette as well as nurturing indi- vidual expression and development of motor skills. 60814 Mon Jan 22–May 14 4:00-4:45pm Gladney-Morgan $177.10R / $212.30NR SAVE THE DATE! 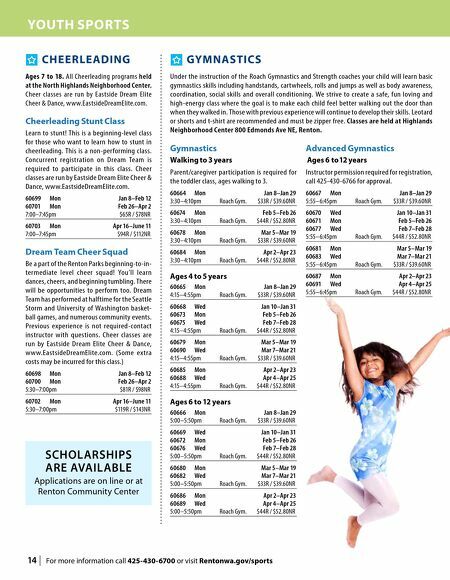 Spring Recital SATURDAY MAY 19, 2018 Recital fee is included in the registration fee.